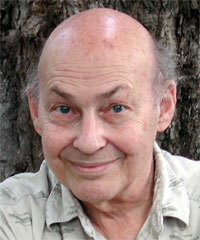 Marvin Minsky is perhaps the foremost living expert on the theory of artificial intelligence. He designed the first neural network simulator in 1951, and the first confocal scanning microscope in 1956. With John McCarthy and others he founded what became the MIT Artificial Intelligence Laboratory in 1959. He designed and built early visual scanners, made key contributions to the development of robotics and computer-aided learning technologies, and he has studied cognitive psychology, mathematics, computational linguistics, and optics. He contributed to the development of Logic Oriented Graphic Oriented (LOGO) language, and with Seymour Papert built the first Logo "turtle" device in 1969. He has proposed a mechanistic theory to explain the workings of the mind, and explain how it might be modeled to create an artificial intelligence. He has described "consciousness" or "self-awareness" as a myth — a convenient but incorrect concept — and said that the key to artificial intelligence will be when computers are designed with common sense. He co-authored the 1992 science fiction novel The Turing Option with Harry Harrison, which envisions the construction of a super-intelligent machine.